...And thats a wrap. 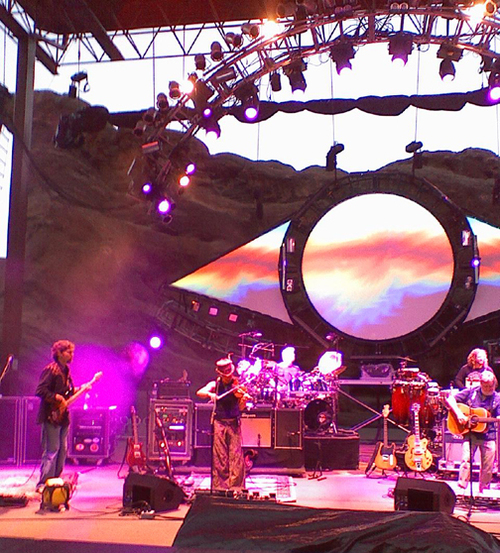 The String Cheese Incident played four incredible nights of music in their home state of Colorado at the ledgendary Red Rocks Ampitheater which marked the end of an impressive run of more than 14 years of performing as a band in one form or another. All 4 nights had their own special musical surprise to them. The first night featured a Miss Browns Teahouse bookending a funky Chameleon. The second night's encore featured drummer Michael Travis in his best Michael Jackson impression, outfit and all for a hysterical Dont stop till you get enough. The Saturday show was packed full of rocking tunes and the whole second set was surrounded by Desert Dawn. And the final show which was one of the more emotional musical experiences of my life, had a surprise acoustic set, 2 monster electric sets that even had a giant octopus puppet rolling through the crowd, Keller Williams sit in, and a 4th encore of the blistering Texas. All I can say is THANK YOU SCI, it has been wonderful. What a terrific shot of the band at Red Rocks. I'm really experiencing venue envy here. Keep up the great work! what an amazing weekend. thanks for the great review and pic. keep em comin!